I have learned to use my gifts. One of my gifts is “The Gift of Good-bye”. You say, “Is that really a gift?” No, but I use my power to remove negative people from my space. It is amazing how people will drain you with their negative outlook. I’m not saying we can’t have bad moments. I’m saying that if your negative “moment” has turned into your overall disposition, then you are not welcome in my circle. Parenting, single parenting, and life in general are hard enough. Get rid of negative people! I don’t mean you have to say to them, “Bye Nancy! You’re too negative”, but, you do need to separate yourself from them for a while. Help them if you can. But, if you cannot, separate. Life is too short to be burdened with negativity. You were made to soar, to live life to the full. If they don’t want to join you, cut them lose (in a nice way). I have learned to release people and feed them with a “long handled spoon”. This translates as “be cordial, but don’t share your hopes, dreams, and personal problems with them”. These folks are not in your life to lift you up. Only to slow you down. Too scared to cut them off? Do It Anyway! I can feel the peace in the air. Don’t you feel better? As single parents, we tend to bear all things. Every bill, every sickness, whether our own or our kids, and every hurt. We have to learn to release negativity and not dwell on all the bad. Our job is difficult enough as is. We must make room for the good. I’m not saying to pretend or wish the bad away. I’m saying to not let it take over your life. Deal with the bills, the money, the shortage of this or that, and spend your energy on the good. Life has so much beauty to offer us. 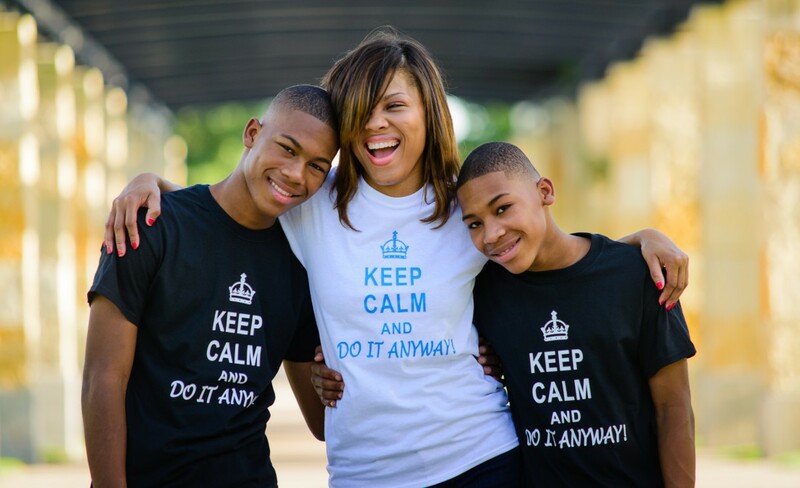 Let’s show our kids that although life can be hard at times, we know the art of Doing it Anyway. With all the positivity of the previous paragraph, I digress to say that I recently learned of the passing of a young woman who was doing great work in the world to inspire women of color to love themselves. She ended up being a light for women of all colors, but she took her own life this Thursday. Hearing her story, I thought about how hard single parenting was for me when my boys were small. Praise God, I never thought of hurting myself or my children, but I remember being tired and wanting to just quit. I wanted to sit in my house and complain about how hard it was to do it alone. I wanted to just have a moment to be where I didn’t have to do everything. I was tired. I was bitter. I was sad. Luckily, I had family and friends that encouraged me to keep going and also chipped in to help. And, I had my faith that would not let me quit. For these, I am thankful. But, I now wonder if I was depressed and did not know it. So many of us are taught to keep going when we hurt, when we’re tired, when we’re wounded. I know I was. I was hurt. I was in a position I had no expectation of being in and I had to deal with it mostly alone. Because of what I’ve gone through I am stronger. I work well now because of it. I can tackle deadlines and handle a million things at once. It made me tough. But, I wonder what of the ones who are not as strong, or do not have the support? I write this post urging us all to take time to find balance and get medical help, if needed. Sometimes what we battle cannot be cured by a night out, a vacation, or a self-help book. Sometimes, we need assistance our family and friends cannot provide. I’m a Christian, and I believe in the power of prayer. I also go to the doctor when I’m sick. One doesn’t cancel the other. Be brave enough to share the great things of life and the dark with those you love and trust. Your kids need you here and no one or anything is worth your life. So, as I close, if life is roses and peacocks for you, that’s great! But, please check on your loved ones. When friends come to mind, call them. We are losing people too young and too old to senseless things. I wrote a post recently about engaging our kids. I find it is absolutely important that we are listening to our family and friends and really being present. We don’t know how people internalize our words and actions. Life hurts because people do the hurting. It’s easy to say “I wouldn’t let that bother me”. But, it really does bother the person who is hurting. Allow them to deal and heal. We can all stand to be more compassionate. Who knows what people are really going through behind closed doors? We must make it okay to be authentic. Live your life to the fullest and love those who love you. Do It Anyway. What Does a Hard Time Have to Do with Flowers? This post is not about parenting per se. It’s about working on your life’s outlook. Having a great outlook helps you become a more balanced parent. Most importantly, this post is about not thinking your life is useless. Life is crazy. It’ll throw a bad moment right behind a great triumph. It’ll seemingly place a moment in time (that seems to last forever) right behind. But, it is still so worth it. Life is hard. Life is scary, challenging, and gut-wrenching at times. But, it’s worth it. I hate when I hear people say they cannot do life or can’t take it anymore. The truth is that they can. What they should say is “I don’t want to endure this anymore”. But, we CAN take it and get past it and conquer it. Whatever it is. We’ve just got to get in the right space. If all one dwells on is negative then there will be no solution. You’ve got to think positive, wrap your mind around another idea. If you can’t, it’s time to get help from a friend who can look at it differently with less tired eyes. I’m not saying thinking positive will solve the problem, bring that person back, or pay your bills. But, it will help you get to a place of clarity and then only can you work on a better solution for you. But, life is worth it. You are worth it. When times are good, we’re good. When times are bad, we fall apart. Why don’t we prepare for the inevitable? I don’t know. But, we need to remind ourselves when trouble comes to see life differently because life is beautiful. I challenge you to change the channel if it depresses you, change friends if they don’t support you, drop that love interest if they don’t love you. But see life as the beautiful, complex gift that it is. You only get one. Don’t let anyone or anything make you think less of your time here on Earth. You are unique and uniquely designed to soar. Life is not a bed of roses, but it sure sends the most beautiful bouquets from time to time. The bouquets are those sprinkled moments of joy that you have to experience for yourself. Keep living to see what delivery awaits you! Life’s hard. Do It Anyway!